Thread: Terrorists Attack Spain, Killing Over 160! MADRID, Spain - Huge terrorist bombs rocked three Madrid train stations at the height of the morning rush hour Thursday, killing more than 170 people and wounding at least 500 just three days before general elections. Officials blamed Basque separatists for the worst terror attack in Spanish history. "This is a massacre," government spokesman Eduardo Zaplana said. Two bombs exploded around 7:30 a.m. local time in a commuter train arriving at Atocha station, a bustling hub for subway, commuter and long-distance trains in Spain's capital. 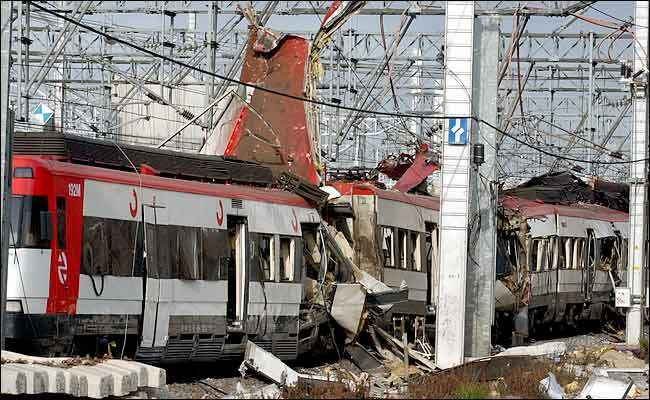 Blasts also rocked trains or platforms at two stations on a commuter line leading to Atocha. People in tears streamed away from the station as rescue workers carried bodies covered in sheets of gold fabric. People with bloodied faces sat on curbs, using cellphones to tell loved ones they were alive. Hospitals appealed for blood donations. Buses had to be pressed into service as ambulances. Foreign Minister Ana Palacio said there were indications the armed Basque separatist group ETA was to blame. "Right now we have to wait until we have an official statement. We don't have this official statement, so we just can say there are some hints and indications that point toward ETA," Palacio told the BBC. Earlier, other politicians and media widely blamed ETA. A top Basque politician denied the separatists responsibility and blamed "Arab resistance." Many al-Qaida linked terrorists were captured in, or believed to have operated out of, Spain. Arnold Otegi, leader of Batasuna, an outlawed Basque party linked to the armed separatist group, denied it was behind the blasts and suggested "Arab resistance" elements were responsible, suggesting al-Qaida. Otegi told Radio Popular in San Sebastian that ETA always phones in warnings before it attacks. The interior minister said there was no warning before Thursday's attack. "The modus operandi, the high number of victims and the way it was carried out make me think, and I have a hypothesis in mind, that yes it may have been an operative cell from the Arab resistance," Otegi said. Otegi noted that Spain's government backed the Iraq (news - web sites) war. Until the latest attack, ETA had been blamed for more than 800 deaths in its decades-old campaign to carve an independent Basque homeland out of territory straddling northern Spain and southwest France. On Feb. 29, police intercepted a Madrid-bound van packed with more than 1,100 pounds of explosives, and blamed ETA. On Christmas Eve, police thwarted an attempted bombing at Chamartin, another Madrid rail station, and arrested two suspected ETA members. The Spanish national police said more than 170 people were killed and more than 500 were injured. The toll would make Thursday the deadliest day ever in decades of attacks by ETA. Until now, the highest death toll was 21 killed in a supermarket blast in Barcelona in 1987. The attacks traumatized Spain on the eve of Sunday's general election. The campaign was largely dominated by separatist tensions in regions like the Basque country, with both the ruling conservative Popular Party and the opposition Socialists ruling out talks with ETA. But the Socialists came in for withering criticism because a politician linked to the Socialist-run government in the Catalonia region, which also has separatist sentiment, admitted meeting with ETA members in France in January. The Socialists were lambasted as allegedly undermining Spain's fight against ETA. Rescue workers were overwhelmed, said Enrique Sanchez, an ambulance driver who went to Santa Eugenia station, about six miles southeast of Atocha station. "There was one carriage totally blown apart. People were scattered all over the platforms. I saw legs and arms. I won't forget this ever. I've seen horror." "People started to scream and run, some bumping into each other and as we ran there was another explosion. I saw people with blood pouring from them, people on the ground," Fernandez said. Spanish officials had said ETA was against the ropes following the arrest last year of more than 150 members or collaborators in Spain and France, including the leaders of ETA's commando network. Last year ETA killed three people, compared to 23 in 2000 and 15 in 2001. No arrests were reported Thursday. "Those responsible for this tragedy will be arrested and they will pay very dearly for it," Acebes said at Atocha. The government convened anti-ETA rallies nationwide for Friday evening and announced three days of mourning. "What a horror," said the Basque regional president, Juan Jose Ibarretxe, who insisted ETA does not represent the Basque people. "When ETA attacks, the Basque heart breaks into a thousand pieces," he said in the Basque capital Vitoria. "This is one of those days that you don't want to live through," said opposition Socialist party spokesman Jesus Caldera. "ETA must be defeated," referring to the group as "those terrorists, those animals." In London, British Foreign Secretary Jack Straw called the attacks terrorist atrocities and a "disgusting assault on the very principle of European democracy." Straw said that Britain stood "shoulder to shoulder" with Spain and was ready to send any kind of material help needed. Elsewhere, European Parliament President Pat Cox said the bomb attacks amounted to "a declaration of war on democracy." This is very tragic and it shows we need to keep fighting the war on terrorism. There are also conflicting reports now as to who is responsible, which is why I won't post an article since they are all different. Al Qaeda admitted responsibility in a letter but the authorities don't know who is to blame. Authorities thought the ETA but then al qaeda claimed it as an attack they carried out, while the ETA denied being involved. So hopefully they'll find out who did this soon and bring them to justice. I'm more outraged than saddened. We're talking about terrorists who have the same genocidal mentality as the Third Reich. I'd bet you a million dollars that Al Qaeda is responsible, since they clearly want to do to all of us what the Nazis did to the Jews. There's no doubt that Bin Laden and his fellow Nazis want to repeat the same thing in this country, and we have to continue fighting them in the War on Terror or else they'll do it. It's infuriating really. It gets me mad too. We spend so much time trying to please middle eastern countries that we ignore the fact that places such as Saudi Arabia, Iran, Yemen, and other middle eastern countries support terrorism! Saudi Arabia gave money to some of the 911 hijackers, but that is being virtually ignored. Meanwhile we gave Saudi Arabia, bin laden's homeland, US millitary vehicles like the M1 Abrams tank, etc. Even in our current stance of fighting in Afghanistan, and Iraq, and ignoring the terror threats elsewhere people complain we are too violent. We need to take an even more agressive approach against these terrorists, whether they be ETA, al qaeda, abu sayaf, ansar al islam, hamas, islamic jihad, or any other breed of terorrist. We are not taking the threat serious enough. This proves the war isnt over and unless we continue fighting it many innocent people will continue to be murdered. 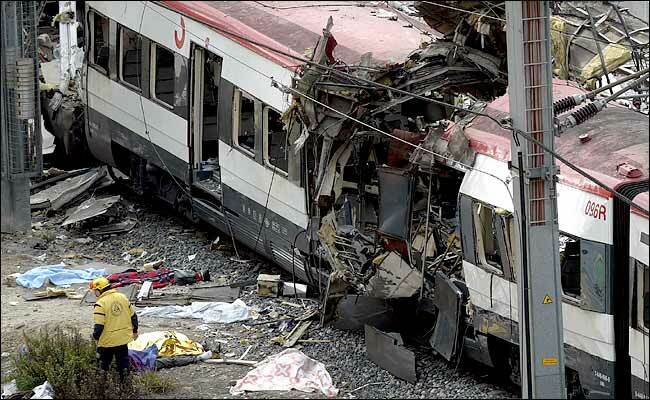 MADRID, Spain (March 12) - A series of bombs hidden in backpacks exploded in quick succession Thursday, blowing apart four commuter trains and killing at least 192 people and wounding more than 1,400. Spain at first blamed Basque separatists but a shadowy group claimed responsibility in the name of al-Qaida for the worst terrorist attack in Spanish history. Panicked rush-hour commuters trampled on each other, abandoning their bags and shoes, after two of the bombs went off in one train in the Atocha station in the heart of Madrid. Train cars were turned into twisted wrecks and platforms were strewn with corpses. Cell phones rang unanswered on the bodies of the dead as frantic relatives tried to call them. ''March 11, 2004, now holds its place in the history of infamy,'' Prime Minister Jose Maria Aznar said. The bombing came three days ahead of Spain's general election on Sunday. A major campaign issue was how to deal with ETA, the Basque militant group that is seeking greater autonomy. Campaigning for the election was called off and three days of mourning were declared. The bombings occurred exactly 2 1/2 years after the Sept. 11, 2001, terrorist attacks in the United States, and was Europe's worst since the 1988 bombing of a Pan Am jetliner over Lockerbie, Scotland, that killed 270 people. The attacks also reawakened terrorism fears among investors. Stocks fell in London and in New York, where the Dow Jones industrial average dropped nearly 170 points. On Friday, Tokyo stocks opened sharply lower. The 10 backpack bombs exploded in a 15-minute span, starting about 7:39 a.m., on trains along nine miles of commuter line from Santa Eugenia to the Atocha terminal, a bustling hub for subway, commuter and long-distance trains just south of the famed Prado Museum. Police also found and detonated three other bombs. The Interior Ministry said 192 people were killed and 1,421 injured. ''An act of barbaric terrorism has engulfed Spain with profound pain, repulsion and anger,'' King Juan Carlos said on national television. Worst hit was a double-decker train at El Pozo station, where two bombs killed 70 people, fire department inspector Juan Redondo said. One corpse was blown onto the roof. At the Santa Eugenia station, ''there was one carriage totally blown apart. People were scattered all over the platforms. I saw legs and arms. I won't forget this ever. I've seen horror,'' said Enrique Sanchez, an ambulance worker. Forty coroners worked to identify remains, the national news agency Efe said, and a steady stream of taxis carried relatives to a sprawling convention center that was turned into a makeshift morgue. Three days of national mourning were declared and thousands of people took part in spontaneous anti-terror rallies across the country Thursday. The government called for nationwide anti-ETA demonstrations on Friday evening, and millions were expected. Who carried out the highly coordinated attack was a mystery. The government put the Basque separatist group ETA at the top of its list of suspects, although a shadowy group claimed responsibility in the name of al-Qaida. ''This is part of settling old accounts with Spain, the crusader, and America's ally in its war against Islam,'' the claim said. Spain had backed the U.S.-led war on Iraq despite domestic opposition, and many al-Qaida-linked terrorists have been captured in Spain or were believed to have operated from there. Spain's government is studying the reported al-Qaida claim but still believes ETA is more likely responsible, a senior official in Aznar's office said. Spain's security forces were not ruling out ''any line of investigation,'' Interior Minister Angel Acebes said. The United States believes Al-Masri sometimes falsely claims to be acting on behalf of al-Qaida. The group took credit for blackouts in the United States and London last year. The purported al-Qaida statement also claimed the terror group would soon hit the United States with a major attack. ''The expected strike against America, is now at its final stage - 90 percent ready,'' it said. Some officials think Spain, along with Germany, was an important staging ground for the Sept. 11 attacks. Since then, Spain has arrested more than 40 al-Qaida suspects. If the attack was carried out by ETA, it could signal a radical and lethal change of strategy for the group that has largely targeted police and politicians in its decades-long fight for a separate Basque homeland. A top Basque politician, Arnold Otegi, denied ETA was behind the blasts and blamed ''Arab resistance,'' noting Spain's support for the Iraq war. The government said ETA had tried a similar attack on Christmas Eve, placing bombs on two trains bound for a Madrid station that was not hit Thursday. The Interior Ministry said tests showed the explosives used in the attacks were a kind of dynamite normally used by ETA. The bombers used titadine, a kind of compressed dynamite also found in a bomb-laden van intercepted last month as it headed for Madrid, a source at Aznar's office said, speaking on condition of anonymity. Officials blamed ETA then, too. In a break with past ETA tactics, there were multiple attacks and no advance warning. ETA has usually gone after one target at a time and the largest casualty toll was 21 killed in 1987. ETA has claimed responsibility for more than 800 deaths since 1968. Sympathy poured in from capitals worldwide, led by Spain's partners in the 15-nation European Union, and neighboring France raised its terror alert level. In Athens, security also was tightened at train stations and the Spanish Embassy, although overall plans for the Aug. 13-29 Olympics will not change, officials said. The United States, Britain and Russia said the attacks demonstrated the need for toughened resolve against terrorists. President Bush called Aznar and Juan Carlos, saying he expressed ''our country's deepest sympathies toward those who lost their life. ''I told them we weep with the families. We stand strong with the people of Spain,'' he said. The U.S. Senate unanimously passed a resolution expressing outrage and urging Bush to ''provide all possible assistance to Spain'' in pursuing the terrorists. Aznar was a staunch supporter of U.S.-led war that ousted Saddam Hussein and Spain sent 1,300 troops to Iraq. Aznar, who himself survived an ETA car bombing in 1995, will step down when a new government is formed after the elections. Revulsion over the attack could benefit Aznar's ruling conservative Popular Party because of its hard-line stance against ETA. Both the Popular Party and the opposition Socialists ruled out talks with ETA during the campaign. ''No negotiation is possible or desirable with these assassins who so many times have sown death all around Spain,'' Aznar said. The Socialists came in for withering criticism during the campaign because a politician linked to the Socialist-run government in the Catalonia region, which also has separatist sentiment, admitted meeting with ETA members in France in January. The Socialists were lambasted as allegedly undermining Spain's fight against ETA. The group - Euskadi ta Askatasuna, or Basque Homeland and Freedom - is believed by police to number perhaps only several dozen hard-core militants who are supported by a wider group of Basque nationalists. The government had recently expressed cautious optimism that ETA was near defeat after mass arrests, seizures of weapons and explosives, increased cooperation from France and the banning of ETA's purported political front. The number of people killed in ETA attacks dropped to three last year. I'm saddened, shocked, and outraged. I've had the pleasure of visiting Madrid briefly; it is a wonderful city and the capital of one of the most beautiful nations in Europe. May whoever did this face justice soon. The death toll has climbed to about two hundred. I really do believe it's Al Qaeda. They've long since joined the ranks of evil genocidal organizations such as the Nazi Third Reich, the Soviet Union under Stalin, the Cambodian Khmer Rouge, and the Rwandan Genocidal extremists :evil: . There's no doubt that the evil Al Qaeda group that brutally murdered the Twin Towers and 3,000 people are emulating have the same mentality as these other evil groups; that those different from them or who do not share their beliefs must be destroyed and exterminated by any means, even if it costs them large numbers of their own minions. Al Qaeda no doubt wants to repeat 9-11 on our soil whenever possible, so tragically we haven't seen the last of this new Third Reich. What's scary about this attack is that it occured in a first-world European country. (Not that the ones in the Muslim world are any less horrible) But it signifies that Bin Laden (if it was him) is regrouping and coming back. This is why the War on Terrorism will probably become a generational war, like the Cold War. By the way, I thought it bizzare that this attack occured 911 days after 9/11. It's definately Al Qaida that pulled this off. The ETA would never choose a date 911 days after 9/11. I hope that we're doing our best to stop another 9/11 from happening here, and unfortunately, this attack heightens our concerns. It was also the 11th of March. But besides that, it definately seems like an al qaeda attack. New information says that three moroccans and two spanish of "hindu" descent have been arrested in connection. The ETA are basque and use terrorism to get the basque region under their control. That is in northern spain. Moroccans and Hindus have no concern with the basque region. So I think its al qaeda, not ETA. Also, if this is al qaeda it is more worrying for a few reasons. It means that they are gaining strenght and organization again. Also, if it is al qaeda, then the message that said an attack on the US is "90 percent" ready was a real one from al qaeda because it also claimed responsibility.